You can hardly turn around today without seeing a movie or television show featuring a superhero and they’re often on the covers of magazines and there are novelizations of their stories. And of course there are the comic books and graphic novels from which many of them sprouted. But what is a superhero? Such is the general question asked and addressed in the collection of essays edited by Robin S. Rosenberg & Peter Coogan. There is a strong collection of writers included here, musing on what makes a superhero and the social issues surrounding a society’s reasons for having superheroes. The collection includes essays from those who might understand the genre the best – writers of superhero stories such as: Stan Lee, Dennis O’Neil, Kurt Busiek, Joe Quesada, and a few others. I was impressed right out of the gate with Peter Coogan’s article, “The Hero Defines the Genre, the Genre Defines the Hero.” I’d like to quote from the article but the truth is I would simply copy the eight pages and reprint it – the article was packed with thoughtful reflection and commentary. Coogan clearly understands the modern mythology of superheroes. A writer fails the genre when a story depicts superheroes who are weak or do not use their powers. What makes a character interesting (both superheroes and other types of characters) is what he does to solve problems. You give him a knotty situation and he gets out of it. Well, by definition, superheroes use extraordinary physical means. While I’m only pointing to two articles, this is one of those rare collections in which there are no duds. Every essay is thoughtful and well articulated. I gained some insight and felt that I left the book smarter than when I started. I like that feeling. Looking for a good book? The collection of essays, What Is a Superhero? 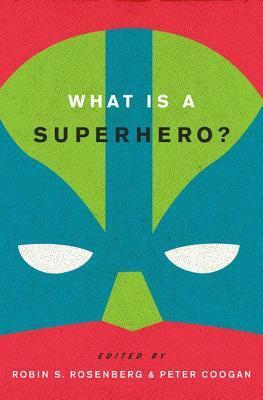 edited by Robin Rosenberg and Peter Coogan is a thoughtful reflection on superheroes – who are our modern mythological figures. The book is highly recommended.